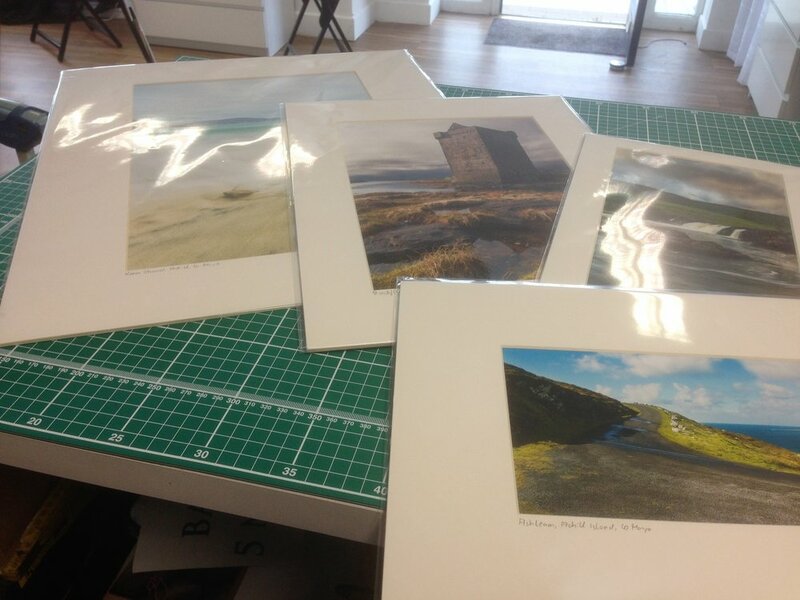 Through years of experience of selling my prints, starting at Christmas and Farmer's Markets to now selling my art in my gallery and selected arts & crafts stores, I select the best possible quality materials and suppliers to ensure long lasting photo prints and wall art. Below I have listed the different finishes I offer with detailed product information and how to care for them. Small and medium sized photo prints between 10x6" and 15x10" are printed in my gallery and are all mounted on archive acid free mounts and backing boards, ready to be put into standard size frames. Every print has its location written on the left corner of the mount, my signature on the left corner on the mount, as well as on the print. On the back of the mount you will find a sticker with the proof of authenticity. Larger prints are made in a trusted professional photo lab in Berlin and only available unmounted, due to shipping issues, where a large flat surface is too weak to withstand risks of bending and creasing. Therefore large format photo prints are carefully rolled up, using acid free silk paper to protect the printed surface and are shipped in tubes. I highly recommend to get large format prints framed by professional framers, who can ensure to mount them correctly to avoid bubbling and/or scratches to the print. When handling the print I also recommend using cotton gloves to avoid fingerprints and other damages caused by direct contact between skin and the print. My acrylic prints are printed on 260gsm Fujicolor Crystal Archive Photo Paper II to ensure the best quality. After drying, the print is frontal mounted to an acrylic sheet with a special liquid silicone, which ensures a long lasting, bubble free display of vibrant colours and impressive contrast. The acrylic prints come ready to hang, with two hooks mounted on the top and two foam spacers at the bottom to give a floating effect. As there is no need for a frame you get a crisp and clean-cut look that will impress everyone. Similar to the acrylic prints, premium composites are printed on 260gsm Fujicolor Crystal Archive Photo Paper II to ensure the best quality. After drying, the print is frontal mounted to an acrylic sheet with a special liquid silicone, which ensures a long lasting, bubble free display of vibrant colours and impressive contrast. But it also is mounted onto an aluminium dibond sheet at the back, as well as having a hidden heavy duty aluminium frame, to guarantee a very sturdy structure. This also ensures that very big wall arts of over 5ft (1.5m) are not warping or misshaping in years to come. Premium Composites are definitely an eye catcher and conversation starter. © 2010 - 2019 Irish Coast Photography | Kerstin Hellmann. All rights reserved.